Launching a new multiyear rights deal with Fox Sports this weekend, the National Hot Rod Association (NHRA) will officially take control of its own on-air destiny by bringing production operations in-house. 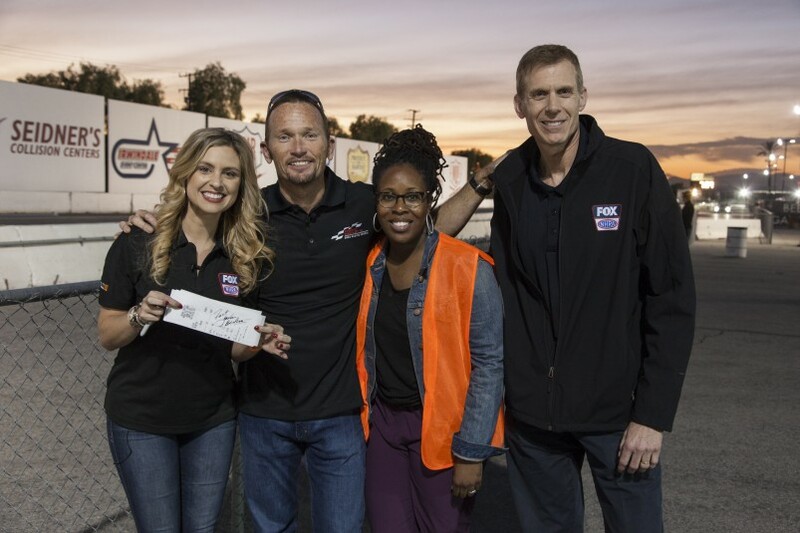 Fox’s NHRA TV package, which kicks off Sunday with three hours of live FS1 coverage from the Circle K Winternationals Finals in Pomona, CA, is highlighted by 17 live telecasts, including four on Fox — the first time NHRA will appear live on a national broadcast network. 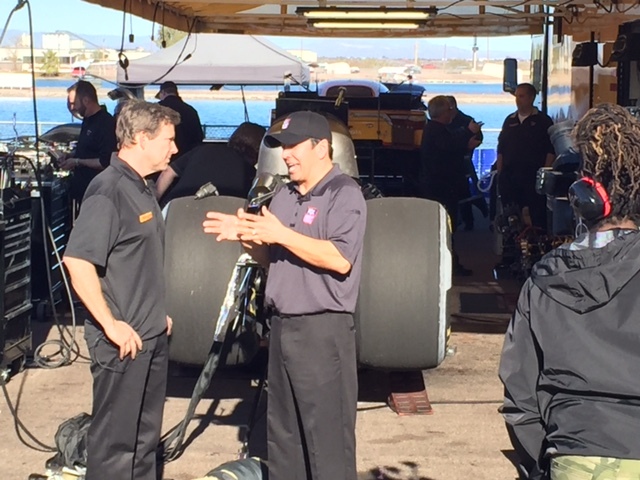 After a rehearsal event in Phoenix last weekend, NHRA’s production goes live this weekend on FS1, presenting qualifying races for the Mello Yello Series on Friday and Saturday, as well as the 17 live telecasts of the elimination races Sunday on FS1 and Fox (the others will be shown in tape delay on weekend afternoons or in primetime). That compares with just five hours of live coverage on ESPN last year. In all, Fox, FS1, and FS2 will combine to present more than 450 hours of programming, including coverage of the Lucas Oil Series, J&A Service Pro Mod Series, and repeats of Mello Yello Series races. 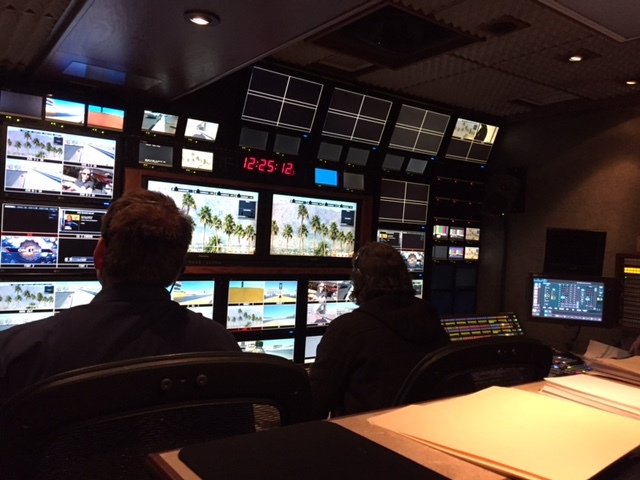 Coverage for all Series Friday-Sunday will be produced out of F&F Productions’ GTX-8 single-expando mobile unit, the former Crosscreek Productions truck that worked ESPN NHRA productions before F&F acquired the company last summer. The production team is a mix of those who worked on ESPN productions (12-15 at key positions) and a crop of fresh talent new to drag-racing coverage. The on-air team will be composed of play-by-play man Dave Rieff (who came over from ESPN), analyst Tony Pedregon (a two-time NHRA Funny Car champion making his full-time–broadcast debut), pit reporters Bruno Massel and Jamie Howe, Indianapolis Bureau Chief John Kernan, and stats/features reporter Lewis Bloom. This weekend’s production will deploy 16 cameras (not counting in-car/on-board units), although Adelson and Rokosa say that will likely change throughout the season as they evolve the coverage. Rather than deploying robotics at the start line as has been the case in recent years, NHRA has elected to bring back handheld cameras this year in order to “get a much more intimate view where you can get literally in the driver’s eyes and really bring viewers to the start line,” according to Adelson. Also new will be a high-angle “game camera” located 50-60 ft. in the stands at the halfway point of the track to capture the entire track — an angle that did not exist previously, according to Adelson. Few, if any, sports TV properties rely as heavily on high-speed cameras as drag racing, considering that cars hit speeds of more than 300 mph and races usually last just seconds. This weekend’s coverage will feature a Vision Research Phantom V642 (capable of 2,500 fps) at one of the two finish lines (for varying Series). 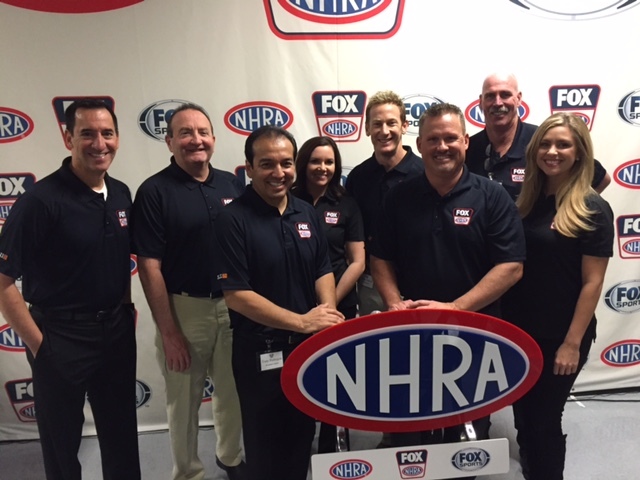 NHRA has retained longtime RF vendor BSI to continue to supply in-car/on-board cameras for the Fox Sports coverage. The television-production team will share camera feeds with the NHRA Event Entertainment group, which produces the in-venue videoboard show, and will be able to integrate the group’s wireless RF fan cameras into telecasts. New to Fox’s NHRA coverage this year will be the Sportvision virtual graphics displaying the start and finish lines and identifying drivers in their respective lanes with virtual name-and-sponsor graphics on the asphalt in front of the car. Sportvision virtual graphics will also allow NHRA to visually illustrate split times to compare drivers’ runs (similar to in Olympic swimming when a virtual line shows how far a competitor is trailing the leader in a race). Fox Sports connected Adelson and company with Sportvision, and the production team plans to use virtual graphics extensively in the telecast each week. A brand-new graphics package and music theme created by Fox Sports for the new NHRA package boasts plenty of the hard-hitting look and sound that viewers have come to expect from Fox. In addition to presenting the Sunday elimination races live, Adelson has put a focus on giving the telecasts a true beginning, middle, and end. Although there will not be a pre- or post-game show this season, the telecasts will start off by setting the stage for that day’s competition and finish with a true awards ceremony, which was not previously presented on TV. “We’re trying to make the whole day feel like it’s a complete show,” says Adelson. “The first 10 minutes of the show, as opposed to just going into the races, we’re going to set up what’s happening: where are we, why are we here, what’s going to happen today, and who are these people? The biggest inherent issue for NHRA in transitioning to a live-telecast model is the potential for delays, a regular occurrence given safety concerns over rain and oil on the track. In addition to preparing a full arsenal of features and content to present during these delays, the NHRA is working closely with teams and their technology partners to try to minimize the oil on the track and other potential causes of delays. Fox Sports’ FS1 will offer three hours of live Finals coverage from the 56th Annual Circle K Winternationals on Sunday starting at 5 p.m. ET. Watch www.SportsVideo.org for A New Era for NHRA, Part 2, focusing on how NHRA is building out a full production operation and new production facility in Glendora, CA, and a news bureau in Indianapolis.